Cowslip can grow up to 25 cm in height, with egg-shaped leaves growing out from its base. Flowers are yellow and umbrella-like in shape, often arranged in clusters at the end of the stem. Cowslip is native throughout most of temperate Europe and Asia, but can also be found growing city parks and urban gardens. This species has played an important role in the pharmacology and mythology of the Celtic Druids. The leaves were once commonly consumed as food. Cowslip’s leaves and roots have also been used in folk-medicine. Uses include anti-rheumatic treatments, as a sedative and for the treatment of gout. Cowslip is also known as Herba paralysis, Verbascum, Primrose or Mullein. Allen, David E., und Gabrielle Hatfield. 2012. Medicinal Plants in Folk Tradition. Timber Press, Incorporated. Hatfield, Gabrielle. 2007. Hatfield’s Herbal. London: Penguin/Allen Lane. Kim JE et al. Skin whitening cosmetic composition for preventing skin pigmentation by comprising coenzyme q10, beta-carotene, tocopherol, extract of Malva sylvestris and extract of Primula veris. Patent Number(s): KR2007079390-A, 2007. GlatthaarB., Saalmüller S., Haunschild J., Amon A. 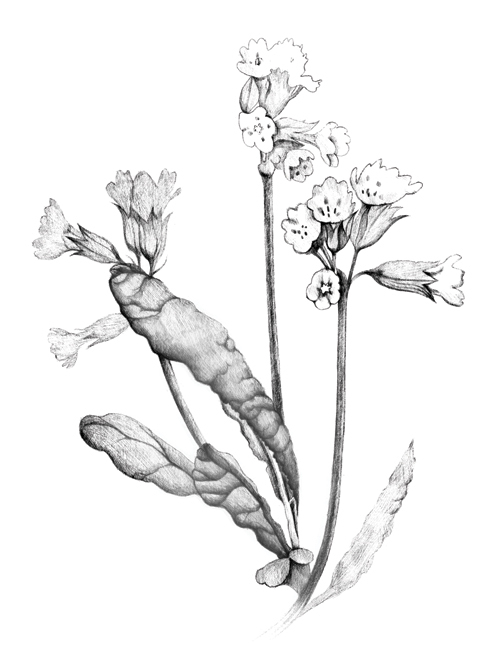 2009 Antiviral activity of a composition of Gentiana lutea L., Primula veris L., Sambucus nigra L., Rumex spec. and Verbena officinalis L. (Sinupret®) against viruses causing respiratory infections. European Journal of Integrative Medicine 1: 258. Bone K, Mills S. 2013 Principles and practice of phytotherapy 2th ed. Churchill Livingstone Elsevier 1051. Blumenthal M, ed. 1998 The Complete German Commission E Monographs. Boston, MA: American Botanical Council. Wichtl, M. 2004 Herbal drugs and phytopharmaceuticals: A handbook for practice on a scientific basis. 3rd ed. Boca Raton FL: CRC Press.